The Bulgarian business climate indicator in March 2014 was 1.2 percentage points higher than in February, the National Statistical Institute (NSI) said on March 28. This was due to the improved business climate in the construction and retail trade, the NSI said. The same day, European Union statistics agency Eurostat said that in March, the Economic Sentiment Indicator (ESI) increased by 1.2 points in the euro area (to 102.4), while remaining broadly flat in the EU (a marginal increase by 0.3 points to 105.3). The headline indicator for the wider EU remained broadly flat (+0.3), due to slipping sentiment in the largest non-euro area EU economy (UK, -4.1) and broadly unchanged levels in the second largest one (Poland, +0.2). On a sector basis, confidence in retail trade declined and was virtually flat in services, rather than showing the moderate increases booked in the euro zone. Both deviations were caused by significant drops in UK sentiment. Industry, construction and consumer confidence behaved in line with the euro area, showing flat and, in the case of consumers, buoyant developments. EU-wide employment plans were in line with those for the euro area, except for downward revisions in the EU services sector and a more tentative upward revision in retail trade. Also the negative euro area selling and consumer price expectations were paralleled on EU-level. 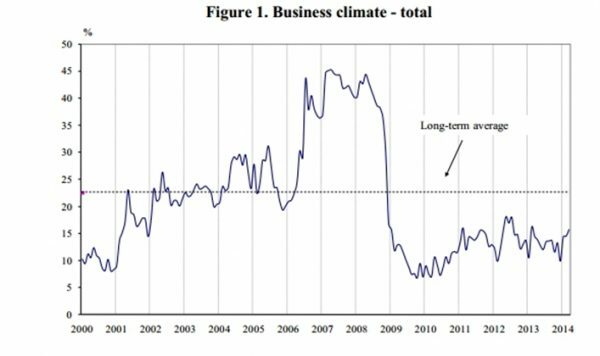 Eurostat said that in March 2014 the Business Climate Indicator (BCI) for the euro area remained broadly unchanged (at +0.39). Managers’ production expectations and their appraisal of past production improved, while the level of overall and export order books, as well as the stocks of finished products, were viewed more negatively.